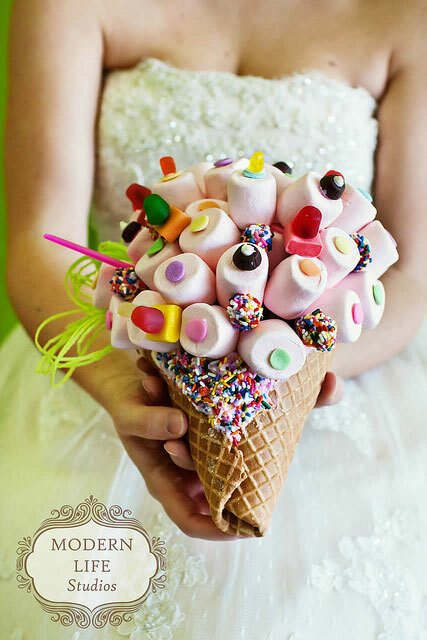 bride.ca | Wedding Trends: A Non-Floral Bridal Bouquet!?? "We regularly come across wedding trends that really make us stop and take notice. Our latest find is not only trendy but also fun to create and easy on the environment"..
What is it? A Non-Floral bridal bouquet! Sounds crazy, doesn't it? 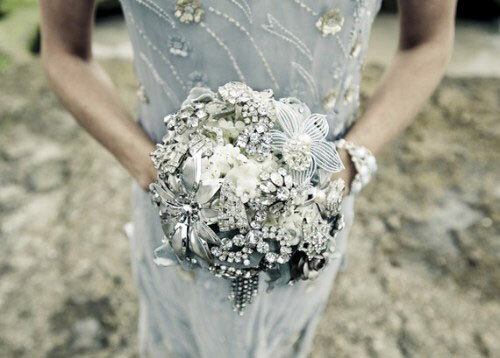 But there is no steadfast rule that says a bridal bouquet must be made of fresh flowers. Actually, bouquets can be created from just about anything. 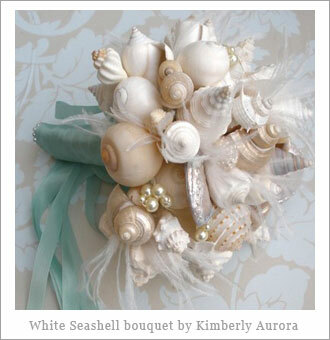 For example: seashells, candy, lace, fabric, and paper flowers all make excellent alternatives to fresh flowers. 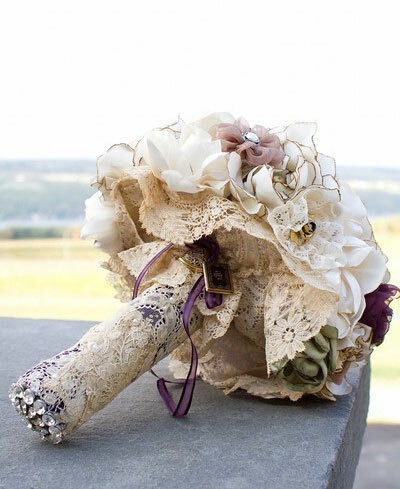 Lastly, our personal favourite: The brooch bouquet (below): Use brooches that your mom and grandma have collected over the years and really turn it into a keepsake. 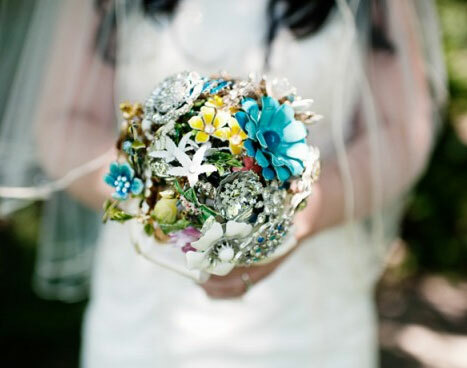 Or, collect brooches yourself, by trying to find pieces that reflect your personality and wedding theme. Better yet, have your friends and family donate a brooch each for the project. 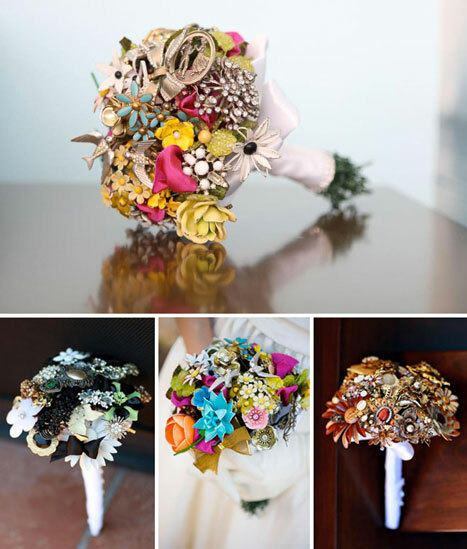 Once you've collected enough brooches, you can start to assemble your bouquet. The end result will be both stunning and sentimental and everyone that participated will have a real part in your wedding. Perhaps you are allergic to fresh flowers or you just like being creative. 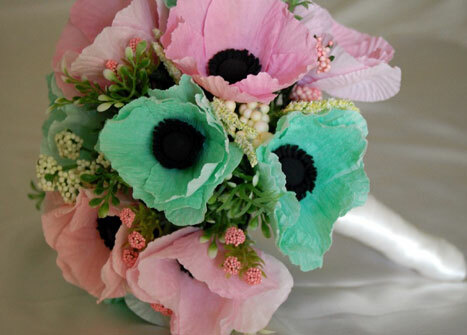 Whatever the reasons may be, alternative bridal bouquets are becoming all the rage. They are less expensive than fresh flowers, they are environmentally friendly and they can be created to reflect the theme of the wedding. All great reasons to start working on one today! Here is another one, submitted by Melissa Gorman on Facebook.com/BRIDE.ca after this story was posted - THANKS!